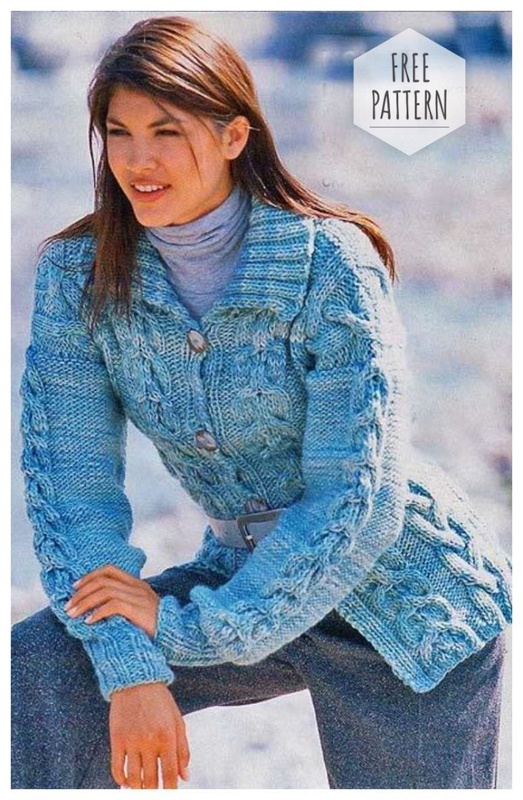 You will need: 700 (800) 900 g turquoise melange yarn Nature-Wool (100% ecologically pure wool, 160 m / 100 d); straight needles number 7 and number 8; circle, needles number 7; 3 buttons with a diameter of 30 mm. Gum 1: 2 persons., 2 out. alternately, 2 persons., in ex. R. knit loops on the pattern. Gum 2: alternately 1 person., 1 out. All further patterns knit on the needles number 8. Outward . Smooth: individuals. R. - izn. n., izn. R. -persons n.
Pers. smooth surface: individuals. R. - persons. n., izn. R. -diz. P.
Scythe A (width 15 p.): Knit according to scheme 1, in which only persons are shown. r., in izn. R. knit loops on the pattern. Repeat from the 1st to the 12th p.
Scythe B (width 12 p.): Knit like a Scythe A, but according to scheme 2, in iz. R. knit knit izn. Repeat from the 1st to the 8th p.
Nodular chrome . : knit faces. Knitting density Average density: 18 points and 17.5 r. = 10 x 10 cm; from smooth surface: 13 items and 17,5 r. = 10 x 10 cm; Spit B: width 6 cm. Back: dial 80 (88) 92 p. And tie for a strap between the chrome. 2 cm with an elastic band 1, starting and ending with a purl. For size 38/40 gum 1 start and finish 2 out. In the last r. straps evenly add 3 (3) 7 p. = 83 (91) 99 p. Now knit as follows: chrome., 3 (5) 7 p. iz. smoothing, 15 p. braids A, 5 (6) 7 p. izn. smooth 12 p. Braids B, 3 (4) 5 p. smoothing, * 2 p. smoothing, 1 p. smoothing, 2 p. smooth surface, symmetrically repeat from *. After 60 cm = 104 p. (62 cm = 108 p.) 64 cm = 112 p. from the slat close for shoulder bevels on both sides 14 (16) 18 p. and in the next 2 r. 1 x 14 (16) 18 p., The remaining 27 p. Postpone. Because of the external braids, the shoulders become a little wider than indicated on the pattern. Left shelf: dial 42 (44) 46 p. And tie for the strap between the chrome. 2 cm as follows, while starting with izn. R .: nodal chrome., 4 p. of gum 2, starting with 1 person., 36 (38) 40 p. of gum 1, starting with 2 persons. and ending 2 life. (Persons.) Izn., Krom. In the last r. straps in the elastic band 1 uniformly add 2 (3) 4 p. = 44 (47) 50 p. Now knit the first 39 (42) 45 p. as on the back to \ but for all sizes, finish after the spit. B 3 p. flatten, the last 5 p. knit for shelves slats as before. Through 54 cm = 94 p. (56 cm = 98 p.) 58 cm = 102 p. from the plank close for neckline cutout on the left side of 6 s. and in each 2nd p. 1 x 4 (3) 3. 2 x 2 and 2 (2) 1 x 1 p. Run on the right side the shoulder bevel as on the back. Finish work at the height of the backrest. Right shelf: knit symmetrically, while in the 51st (51st) 55th. 71st (73rd) 77th and 91st (95th) 99th p. slats to perform on the shelf slats on 1 button hole. For each hole, close the 3rd and 4th paragraphs and in the next p. dial them again. Sleeves: dial 28 points and tie 11 cm with 1 for the strap, while starting from the inside. R. and between chrome. start and finish 2 persons. In the last r. double strap between chrome. every n. = 54 n. Now knit on the middle 12 s. braid B, on both sides of it knit wear. satin stitch. At the same time, from the slat, add for bevels of the sleeves on both sides in each 18th p. 3 x (in each 10th p. 6 x) in each 8th p. 6 x and in each 6th p. 3 x 1 p. smoothing = 60 (66) 72 p. Through 41 cm = 72 p. from the strap all loops to close, while tying in braids 4 x 2 n. together persons. Assembly: perform shoulder seams, if desired, slightly positioning them. For the collar, on the inside of the left side of the left side of the left side, cut 25 p., Set aside 27 p. Of the backrest, knit it with an elastic band 1. at the same time, start with 2 persons, then type 24 p. 1, including looped loops in the pattern, here perform chrome. also as nodular. At the height of the collar 13 cm close all the loops on the picture. Sew in sleeves, complete side seams and sleeve seams, sew on buttons.